00:06 In this episode, we're going to build upon the Future type we implemented in a previous episode. Specifically, we'll use the Future type as a basis to build a simple reactive implementation. While a future is an abstraction around a one-off callback, a signal in a reactive library models values over time. 00:38 You'd use a future in an asynchronous API if the call only delivers one result, e.g. most network calls or some expensive computation. In contrast, you'd use a signal if you have to handle multiple values over time, like for a button that can be tapped multiple times, or for a text field that changes its value with each new user input. In the case of the signal, we have to think about some additional issues, like memory management (to avoid reference cycles), and subscription management (to allow clients to opt in and opt out of receiving values of a particular signal). 01:17 The motivation behind writing a small reactive library from scratch is really to understand the concept of reactive programming on a deeper level. Our goal isn't to write production-ready code, but rather to wrap our heads around what's going on behind the scenes when using one of the existing reactive libraries. 04:30 The Signal implementation is now very simple, but also very limited. We'll have to add back some more complexity once we build out this type further. 04:49 The first enhancement we'll make is to separate the Signal's API into a sending part and a receiving part. This is a very common pattern in reactive libraries, because it allows you to control who can send new values into the signal vs. who's only allowed to subscribe. 06:43 With the pipe method in place, we were able to make send private again. The ability to send new values now only gets exposed via the pipe method. 10:23 In this approach, we don't want the text field to reference the signal, but rather the signal should reference the text field (via the key-value observer). This has the advantage that it's more flexible, since we'd have to subclass the text field or use associated objects to store a reference to the signal in the text field itself. 12:09 The KeyValueObserver class is a simple wrapper around KVO that calls a function each time the observed property changes. It also manages the observation lifetime: once the key-value observer instance goes away, it stops observing the text field. As long as the key-value observer is alive, the observed object is guaranteed to be around as well, since the observer instance holds a strong reference to the observed object. 15:16 Now the observer will be alive as long as the signal is alive. Since the signal is stored in a property of the view controller, new values will be sent as long as the view controller is around. 15:33 Unfortunately, we accidentally introduced a reference cycle, which makes it so that the signal will never be deallocated. Once we set the vc variable to nil, the view controller gets deallocated and "Removing vc" is printed in the console. 16:57 One very useful tool to further diagnose the problem is Xcode's memory debugger. Since this doesn't work in a playground, we'll just copy/paste our code into a command line project and continue working in there. 17:40 In the sidebar we see all the objects that are alive, e.g. the Signal<String> instance that shouldn't be around anymore. On the right-hand side, we see all the objects involved in the reference cycle that keeps the signal alive: the signal references the key-value observer through its objects property, and the key-value observer references the signal via a few more intermediate steps. 18:16 This visualization can be very helpful in diagnosing the problem. 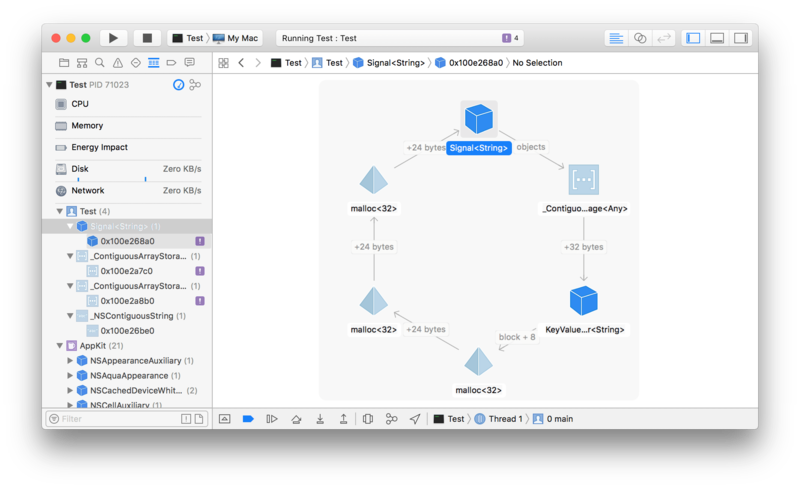 However, sometimes the memory debugger isn't able to generate a graph like this, but it'll still show the objects that are alive in the sidebar. 19:10 In the upper-left corner we have the view controller, which strongly references the text field and the string signal (as indicated by the arrows). The string signal references the closure with the print statement, as well as the key-value observer it uses to observe the text field for changes. The key-value observer in turn holds a strong reference to the text field. 19:40 This might already look like a reference cycle when you look at the left part of the diagram (view controller – string signal – key-value observer – text field – view controller). However, not all references are pointing in the same direction, so we don't have a problem yet. 19:55 The key-value observer also references the closure that gets called when the observed property changes. In our case, this is the function that feeds the new values into the sink. In turn, the sink strongly references the signal, since the sink is just the signal's send method. So here's our reference cycle. 21:50 With this minor change, the reference cycle is fixed, which we can see from the printout in the console "Removing signal", as well as in the memory debugger. 22:31 In this case, the reference cycle was caused by a mistake in the implementation of Signal. However, there are also cases where it's the responsibility of the consumer of the API to not create cycles. For example, if we were to refer to self in the closure we pass to the subscribe call in viewDidLoad, we would've created a reference cycle between the view controller and the signal. To avoid that, we'd have to specify weak self or unowned self in the closure's capture list. 23:27 With this problem out of the way, we'll add a bit more functionality to our Signal type next time!